If you find yourself picking up loaves from the store because you just don't have time to make your own bread, you might consider some bread-making shortcuts. There are kneadless bread recipes that replace fifteen minutes of kneading with a day sitting in the fridge, or you can get a machine to do the work for you. I've found that bread machines do a pretty good job of kneading but aren't so great at baking. Instead, my favorite labor-saver is the bread hook on my KitchenAid mixer. 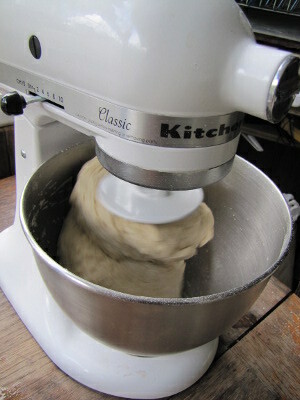 I let the mixer do the kneading and I monitor the rising and baking myself. Others of you might have the opposite reaction to this week's project --- you may love bread-making so much that you want to try out whole grain breads or your own pizza dough. The latter is the easiest next step since the recipe I've included in this week's lunchtime series works perfectly as a pizza dough. 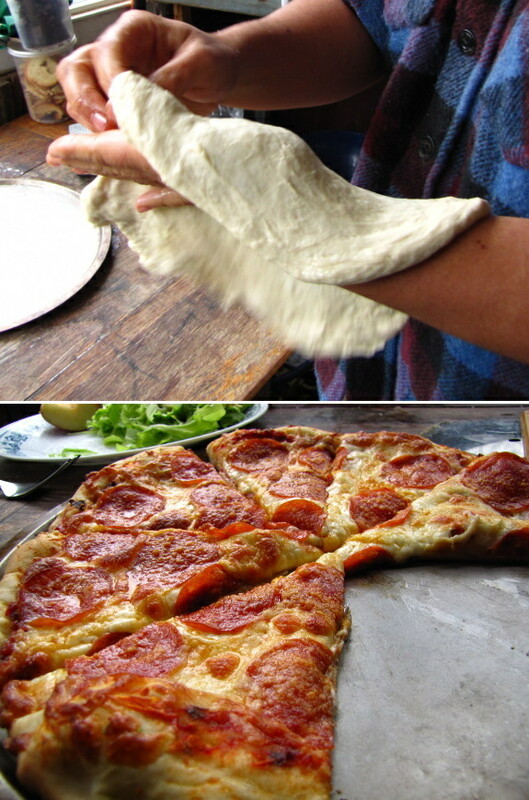 You'll just have to learn how to stretch the dough into a round shape. Even if you don't want to toss the dough over your head, I recommend doing this step in the air with your hands rather than on the counter with a rolling pin. Whole grain breads will require a bit more experimentation on your part. This is my favorite whole wheat bread recipe, which uses added gluten and a long kneading time to create a bread nearly as fluffy as the white version. What's your favorite recipe? Our family eats almost no bread any more (18 months ago I was grinding wheat and baking everything from scratch; now I just don't bake) but when we did my favorite source for whole wheat help was the Laurel's Kitchen Bread Book. 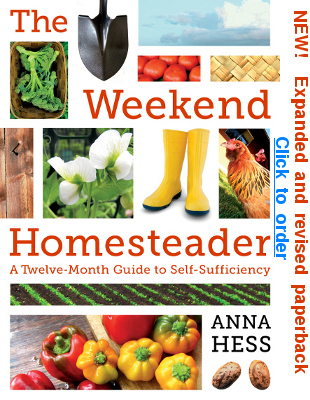 Excellent information and tons of great recipes. I know what you mean --- it's a bit ironic that once we finally decide to start grinding our own grain, Mark joined me in the (mostly) wheat-free camp. Maybe that's a natural progression --- flour to grinding your own to eating stuff that's better than grains?